Enjoy the Big League Experience! Join us on Thursday (07/26) for a bus trip to SunTrust Park to see the red hot Atlanta Braves host the LA Dodgers. The buses will leave the Museum at 4:00 pm. Only $50.00 gets the game ticket, bus ticket and dinner bag from the Old Corner Hardware Store Cafe. Join us for the Ty Cobb Memorial Golf Tournament at Highlands Walk at Victoria Bryant in a Lauderdale style play on Friday July 27, 2018. 9:00 am tee times. Lunch to follow Tournament fees are $75/player, $300 /team. Join us for a "Breakfast of Champions" Saturday (07/28) morning at 8:00 am at the Swails Center at Emmanuel College. 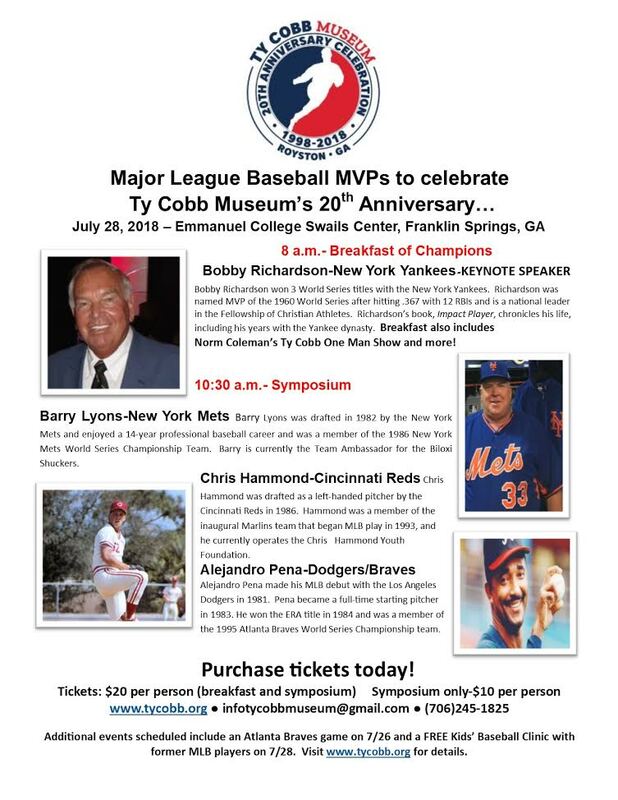 The Keynote Speaker, Bobby Richardson, NY Yankee will be the feature presentation. The Cobb Edu-cation Foundation will share the stage. Join us for the Legends for Youth Baseball Clinic as (8) former major league players will teach your kid the basic fundamentals of baseball and give them a lesson or two in Life. 10:00 am - 1:00 pm EC Baseball Field ENJOY THE BIG LEAGUE EXPERIENCE! The Cobb Memorial Hospital display inside the Ty Cobb Museum will be unveiled on Friday July 27, 2018 at 5:00 pm. The Hospital may be gone, but the memories will live forever. Don't miss this historic moment in local history.